This publication emerged from the reading and discussion group titled “WE READ: GTC AS A BOOK” which happened on 29th of November 2014 in the Youth Cultural Center in Skopje, as part of the ongoing project LIVING LIBRARIES: archives of citizen disobedience (https://zivibiblioteki.wordpress.com/). The book is partly transcript from that meeting whose aim was to read Skopje Shopping Center (GTC) in Skopje. 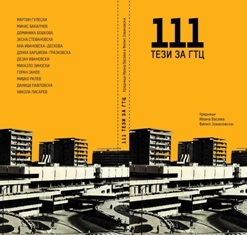 111 thesis about GTC is a book created by experts’ thoughts about the significance of this object set in 11 thesis made by 11 renown thinkers of the contemporary architectural scene in Macedonia (two jointly wrote 11 thesis) and is edited with the help of all participants and the moderator of the discussion. We are all in this alone by Hristina Ivanoska and Yane Calovski addresses the notion of faith in today’s concurrent and multiple socio-political conditions. The project references a number of intricate sources: a fresco painting from the church of St. Gjorgi in Kurbinovo, painted by an unknown author in the 12th century, as well as writings by Simone Weil, Luce Irigaray, and personal notes by Paul Thek dating from the 1970s. While searching for political values in the representations of formal aesthetic and literary sources, the work carries a specific urgency to articulate ways we continuously engage and disengage the past from the present while questioning the notion of faith. External activity | Yane Calovski | Nationless: A Continuous Struggle - a collection| organized by Institute of social sciences and humanities – Skopje | Yout cultural center (MKC), Skopje | 4 April 2015. Artists: Olson Lamaj (AL), Iordanis Stylidis (GR), Maria Sarri (GR), Dragan Protic – SHKART (SRB), Visar Arifaj – STRONG PARTY (KS), Milos Miletic and Mirjana Radovanovic- KURS (SRB), Nada Prlja and Branko Prlja (MK), Angeliki Avgitidou (GR), Branko Teshevic – STREET HERO (SRB), Yane Calovski and Nayia Frangouli (MK/GR), Velimir Zernovski (MK), Filip Jovanovski (MK) and Gjorgje Jovanovik (MK).